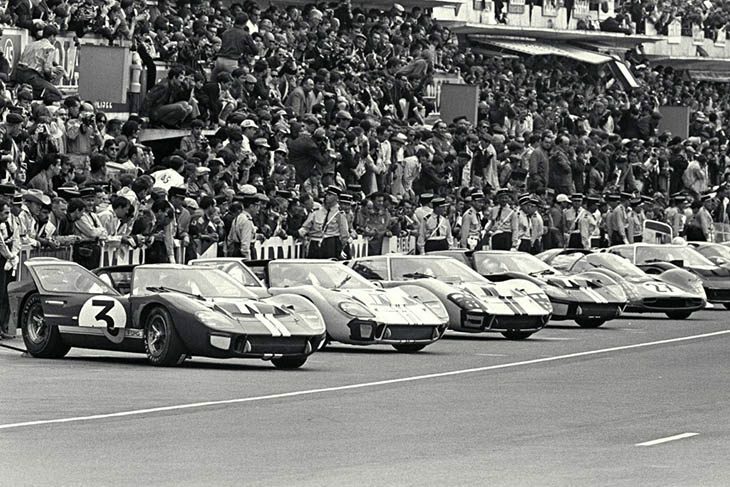 This weekend we have heard a great deal about the 50th anniversary of Ford’s famous 1-2-3 win at Le Mans in 1966. 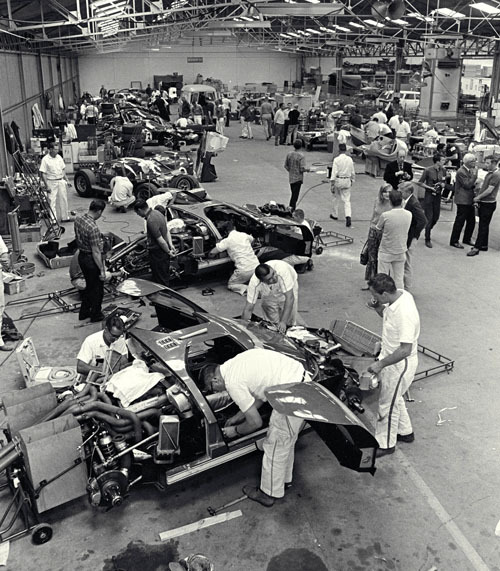 The story is a dramatic one, but stripped down to its barest essentials: Ford (right) tried to buy Ferrari; failed; made spectacularly unsuccessful attacks on the 1964 and 1965 races; launched an overwhelming campaign in 1966; saw the Ferrari resistance fade away as that race unfolded; and instructed Ken Miles and Bruce McLaren not to race each other to the flag, but to cross the line side by side. 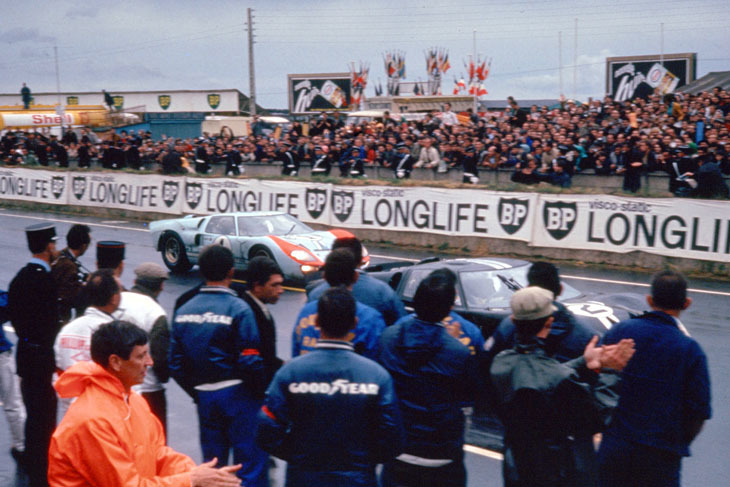 It wasn’t a dead heat because the #1 Miles/Hulme car was two spots ahead of the #2 McLaren/Amon car on the grid, therefore car 2 had travelled further in the 24 hours, and was declared the winner. Sounds pretty simple and familiar, but the end of the 1966 race is probably the most mis-reported finish of a major race in the history of the sport. Many contemporary journalists, and authors who have tackled the subject since, have completely missed the intricacies of the situation. A good number of sources assert that the dead heat went wrong because of the ACO’s eccentric decision that car 2 had travelled further. Some authors have gone so far as to say that the so-called “distance rule” simply never existed. There is understandably some doubt on that point, because when asked by Ford late in the race, the ACO initially said that a dead heat was possible, but then later told Ford that the distance rule would prevent it. Were the ACO officials initially not familiar with their own regulations, or were they just making it up as they went along? But what did the two drivers know? Again, the most common assertion is that they knew nothing of the distance rule. 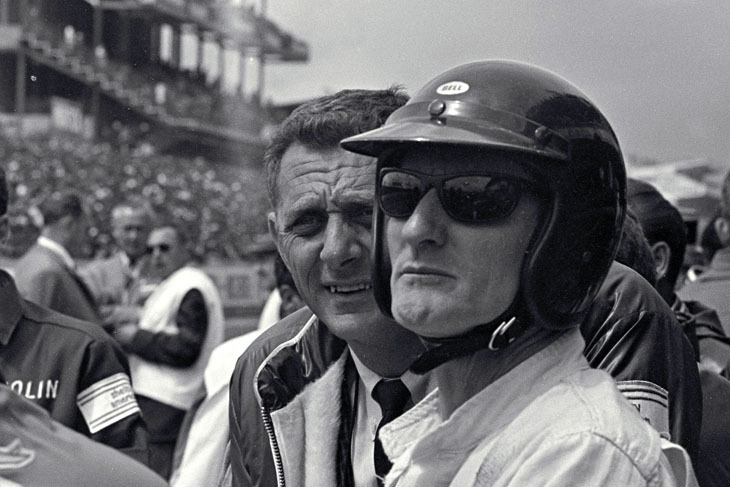 But intriguingly, Ken Miles’ biographer Art Evans (who is one of the few people who discussed the race with Miles before Miles (below) was killed eight weeks after Le Mans) claims that Miles did know that the distance rule existed. 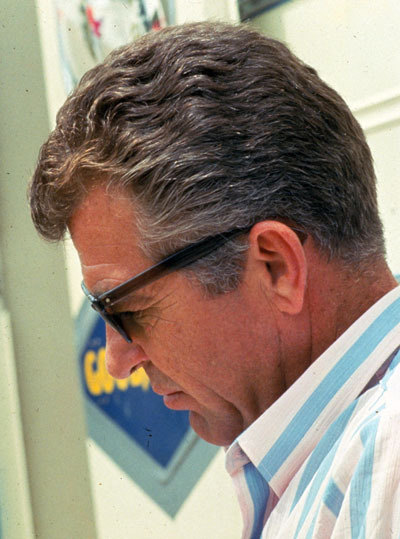 The fact that Evans actually discussed the race with Miles is potentially persuasive on this point – but then again, if Miles knew about the distance rule, he must have known he had lost the race at the finish line, so why did he and Hulme start driving into victory lane, Miles bitterly grumbling a few minutes later that he’d been screwed? 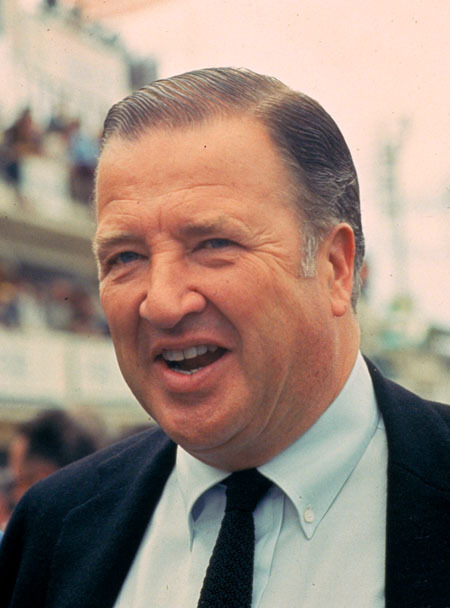 Indeed, there is even a suggestion that Miles was actually a lap ahead, but that the Ford officials perversely persuaded the ACO during the race there had been a mistake and he should be docked a lap. 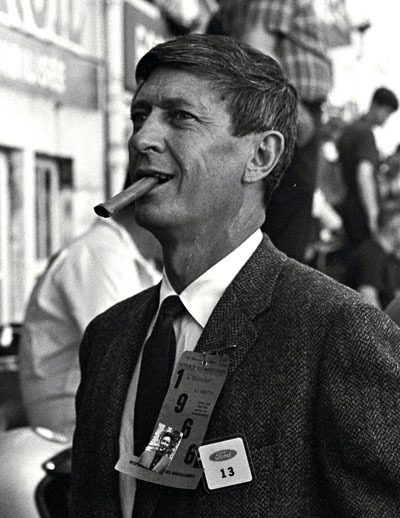 Shelby photographer and scribe Dave Friedman pushed that line in Remembering the Shelby Years 1962-1969; I corresponded with him for another article I have written on the 1966 race, and he was certainly pretty adamant on the point. 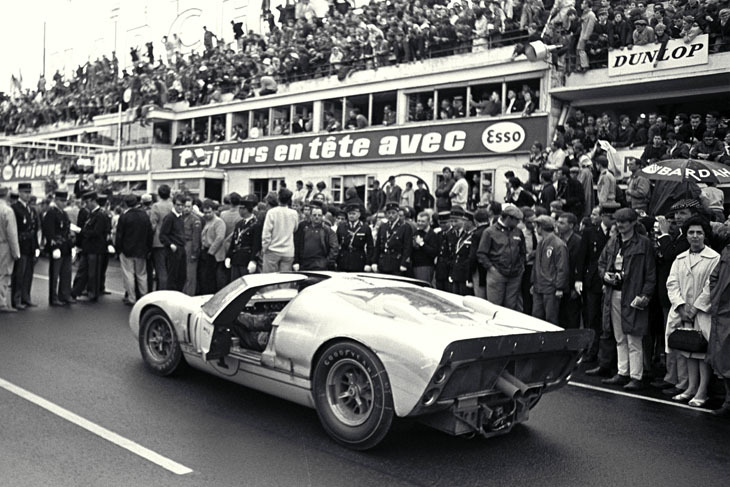 Further, David Hodges, in the 1998 edition of Ford GT40, comments that in the 1990s, there was a campaign in America to get the 1966 Le Mans results changed, for that very reason. Then again, Friedman tells us that, when Miles was told of the form finish, he disgustedly said “so ends my contribution to this motor race”. He would hardly have made that comment if he thought he was a lap ahead of McLaren. I think the “docked lap” theory can be put to one side. 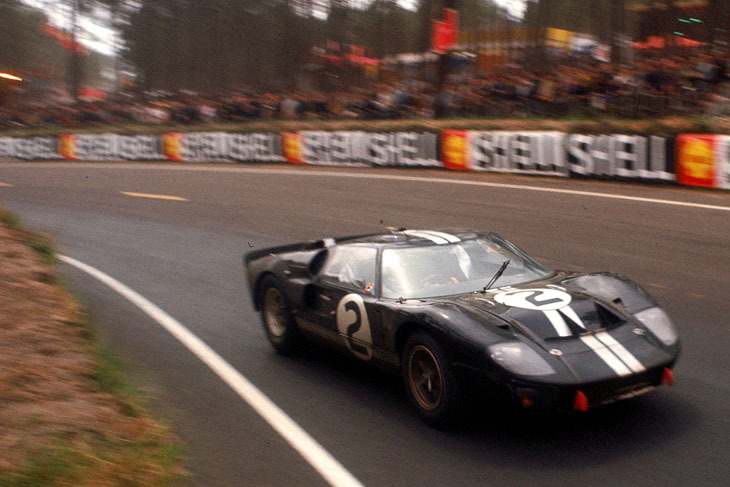 Indeed, it is significant that in the new book Ford GT: How Ford silenced the critics, humbled Ferrari, and won Le Mans the theory is only given very scant attention, even though Friedman is a co-author. So what happened as the cars crossed the line? One thing is absolutely certain: as they passed the man waving the chequered flag, McLaren was about a length ahead of Miles (above). 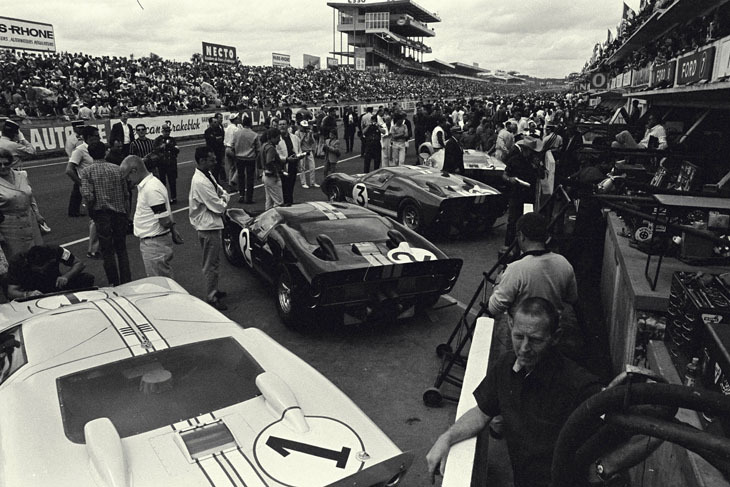 A whole cottage industry has grown up as to how that came about: Henry Manney in the Road & Track report of the race asserted that Miles braked or backed off, a view later endorsed by Leo Levine in Ford: The dust and the glory, Ronnie Spain in GT40, Pete Lyons in Autosport, Dave Friedman, and Art Evans. This view also gained favour in Eoin Young’s Bruce McLaren, and was adopted by Chris Amon in an interview in Motor Sport in 2002. But Carroll Shelby has said he doesn’t think that Miles backed off, and Denny Hulme thought that McLaren sped up at the very end. And in Forza Amon!, published in 2004, Amon (contrary to his 2002 interview) said that McLaren, determined to win, made absolutely sure he was in front as they crossed the line, and that Miles was upset about it. Miles is said to have commented to his mechanic, Charlie Agapiou, late in the race that, irrespective of any Ford decision about the finish, he wasn’t going to finish second. But McLaren had made an almost identical comment, so perhaps the Kiwi did indeed speed up to beat Miles as they reached the line. But that view is not only in the minority, it doesn’t have the feel of commonsense to it. The cars were going very, very slowly as they took the flag: if Miles thought that McLaren had dudded him, Miles could easily have accelerated back into the lead. Well then, perhaps the man with the chequered flag wasn’t standing on the finish line, and the race actually ended somewhere else? Indeed, perhaps the regulations said the race ended precisely at 4pm, not at the finish line at all, in which case we’ll never know which of the two Fords was ahead on the stroke of 4 o’clock, somewhere out on the circuit on that last lap. But assuming for a minute that the race did end on pit straight, there is an interview on Youtube where Ronnie Spain mentions the view that the true finish line was at the start of the pits, not at the chequered flag, and that the cars were pretty much dead-heated as they crossed that first line. 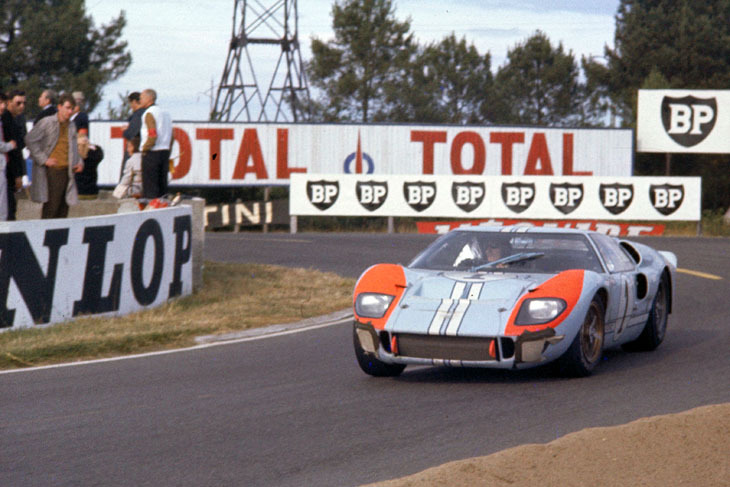 This theory (amongst others) also gets a solid airing from Preston Lerner in Ford GT: How Ford silenced the critics, humbled Ferrari, and won Le Mans. But if that is right, why haven’t more authors emphasised the point? Film of the finish confirms that the cars were almost exactly side by side as they approached the pits, before the gap between them widens as they reach the man with the flag, some distance further along. But even if they were side by side at some earlier line where the race actually ended, the distance rule was always going to sink Miles. And how ironic is it if the ACO deserves to be criticised, not for having the distance rule in the first place (a rule which actually has some point to it), but for being so idiotic as to have the man with the flag standing on a painted line some distance from the actual finish line. In a close finish, this was always going to be needlessly confusing for everyone involved. But alternatively if the finish was in fact at the chequered flag, why do so many authors (and some of the participants) speak of it as a dead heat, when it plainly wasn’t? If the chequered flag marked the finish line, then McLaren (below) clearly won, and there was no need to have invoked the distance rule at all. 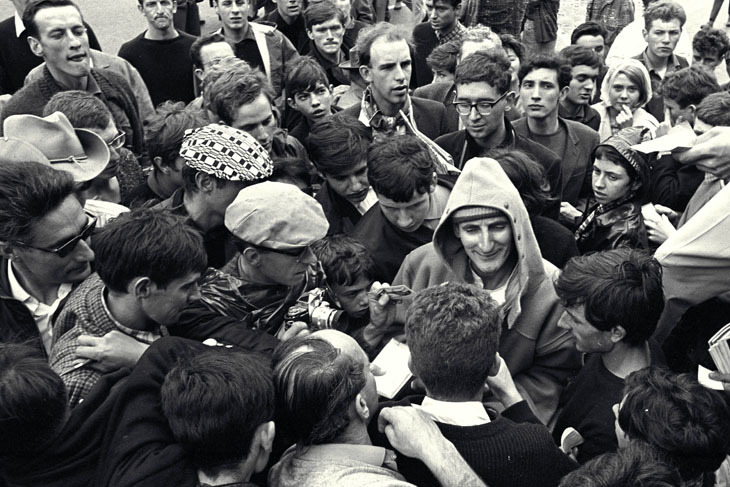 The more books and articles that one reads on the finish of the 1966 race, the more one realises that many of the key players have contradicted each other and sometimes themselves over the years, such that there is now no version of the event which can fit all known facts. 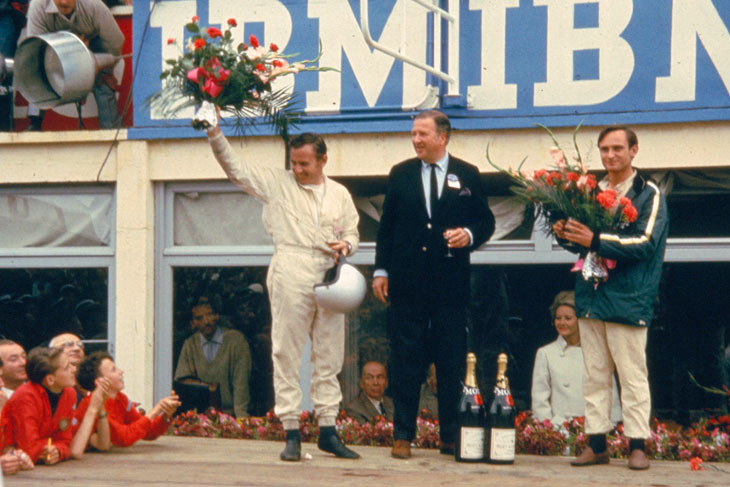 The true story of the finish of the 1966 race will therefore forever remain a mystery. If any journalist ever did the digging that needed to be done straight after the race, finding a copy of the regulations, to see if the distance rule existed, and when and how the finish of the race was defined, he has kept very quiet about it for the last 50 years. In the coming days there will be a blizzard of publicity and comment about the 1966 race. Ford will naturally seek to emphasise what a great triumph it was for the marque, as indeed it was. 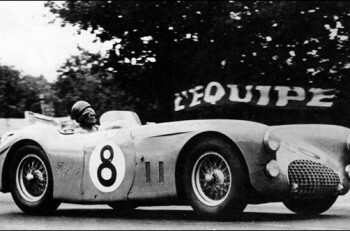 Then, as now, the manufacturer is more important than the driver at Le Mans; Leo Beebe, a good company man, had absolutely no doubt on that score. Like hundreds of team managers in the history of the sport, Beebe (right) had to make a call as to which of his cars was going to win. For various reasons, he chose McLaren and Amon; the side by side finish was simply a flourish, a symbolic and defiant gesture to mark Ford’s first win in the great race. 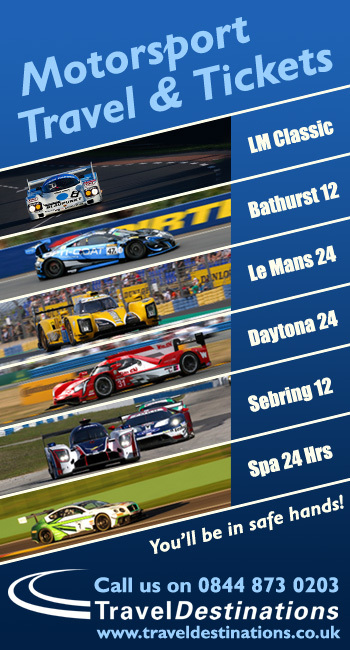 So the victory stood proudly as Ford’s finest hour in the sport. And yet Beebe could never have anticipated that so much attention would end up being diverted from Ford’s wonderful win. In the face of such an overwhelming corporate campaign, it was more than a little ironic that the very moment of the company’s triumph was marginalised by the actions of a determined Kiwi, an irascible expatriate Englishman, and some regulations which weren’t even clear to those who administered them. 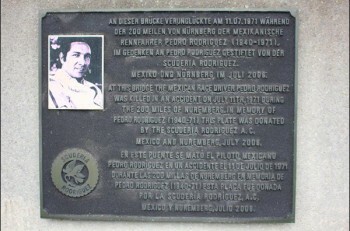 With grateful thanks to the Ford Motor Company and the Henry Ford Archives for their cooperation in the sourcing of photographs to illustrate this feature. 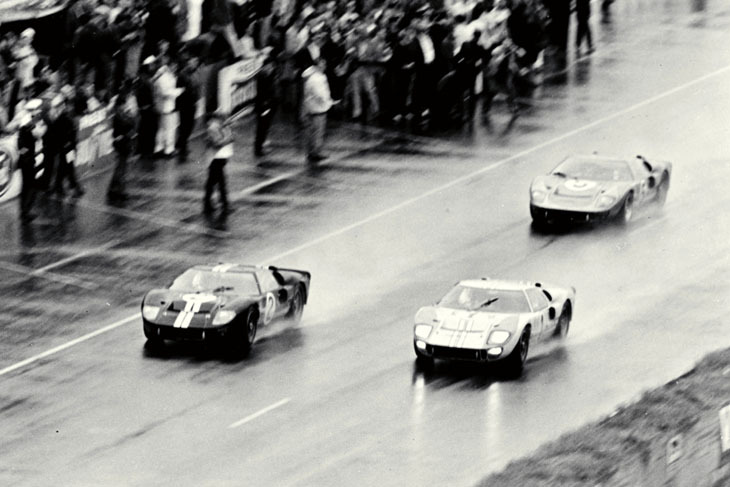 Newly discovered film footage from the 1966 race also features on the Ford Performance website.